I think most of you will agree with me that having a gas stove is the best way to go in terms of efficient cooking, kitchen organization, and savings. A gas stove, whether it is a simple two-burner stovetop or a complete gas range, it is very easy to put into place in the kitchen. As long as it has access to the gas line, you can put it anywhere. It is also cheap in terms of energy consumption and maintenance. Compared to electric, radiant heat, glass top, and induction heat stoves, gas stoves have few and cheap parts that are easy to replace and repair through DIY. No need to call an expensive technician or change the entire unit right away. The best thing about gas stoves is how easy and efficient it is in terms of cooking. You have total control on the temperature through the knob which adjusts the strength of the fire. With the use of the best cookware for gas stoves, you can maximize the potential of your stove in creating top-tier dishes for the family. With a wide variety of cookware in the market, how do we know which one is the best? Every brand claims to be the best. Every company claims to have the latest technology or the best cookware features. Which should you choose? 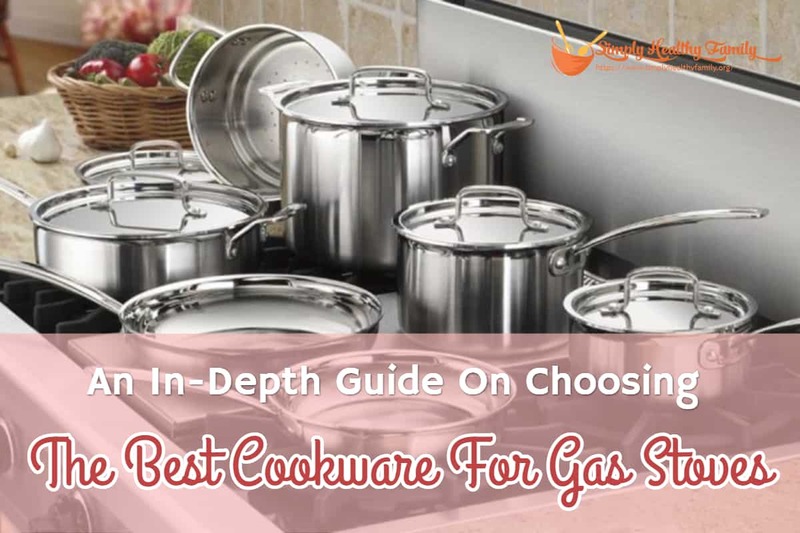 Here are some of the things to consider to choose the best cookware for your gas stove. A kitchenware analysis will never be complete without the discussion of the material. It is the most vital thing that you have to consider in choosing any type of cookware. Cast Iron cookware is known for its durability. With proper care and maintenance, it can last for a long time. It also has good heat retention so it continues to heat the food with residual heat even after the heat has been turned off. Although It heats up relatively slow, it is a good heat conductor and cooks evenly. The downside of cast iron is the maintenance needed for it to last long. You need to season cast iron cookware so that it becomes nonstick. It needs by dried washed right away and dried to avoid its mortal enemy; rust. Stainless steel cookware is not just tough but also very beautiful. This is why it is the preference of caterers and people that love to have dinner guests. It doesn’t rust easily and is also very easy to maintain. In terms cooking, it has a good heat conductivity and even heat distribution. Copper cookware is popular because of its very strong heat conductivity. It heats up really fast, cooks food easily, and retains heat pretty well long after the heat is turned off. It is also lighter than cast iron and stainless steel. Just make sure that the copper cookware is lined with tin, silver, or steel. Copper by itself reacts to almost anything under heat, even moisture. It emits harmful chemicals and it gets mixed with our food. It also reacts to sodium, or salt, causing a metallic taste. Good thing these issues are solved by lining copper cookware. When you lean towards getting aluminum cookware, make sure it is anodized aluminum. The good thing is that I haven’t seen any aluminum cookware that is not anodized nowadays. Without this process, aluminum reacts to acidic foods such as tomatoes, citrus, and vinegar. The good thing about anodized aluminum is that it is really sturdy, lightweight, conducts heat well, distributes heat evenly, and has a good heat retention. It is the most preferred cookware by regular folks as well due to its reasonable price. Your cooking needs come into play in this decision. Do you cook for just a person or two? Do you cook for a family? Are you a business or have people come over regularly? On the other hand, if you cook for a large number of people all the time, make sure to get a large enough cookware set so you don’t have to cook in batches. Don’t get large pots and pans if you don’t intend to cook for a crowd. You will be the one to suffer from cramped cooking space and unnecessarily large dishes to wash. If the cookware is irrationally heavy, transporting it will be a risky and inconvenient thing to do. Choose a lightweight cookware set especially if you are into tossing and flipping. Bear in mind that heavy cookware heats up really slow and cools down slowly too. These are features that make cooking safer and more convenient. It includes generously long handles that have enough space for you to grip without touching the hot surface. It would also help if the handles stay cool, silicone covered even. Another feature that you can consider is the clear glass lid. This way, you don’t have to open the lid just to check on your food. Moisture and flavor remain intact. It also looks good on cookware. It is a huge bonus if you have a cookware set that is versatile enough to be used not just with your gas stove but also with other stove tops such as electric, radiant heat, and induction heat. It is also best if you can find a set that is oven safe, so you can just pop it in the oven without the need of using another set. So now let’s get to the detailed part. Check out what we have as the best cookware for gas stoves. The first thing to notice about this set is the black color. It is very beautiful and the color is neutral enough to match any kitchen theme. The main feature is the thermo-spot technology. The center pattern of the cookware will glow bright red if the cookware is preheated enough and ready for cooking. It has everything you need in a cookware set such as a healthy nonstick surface, oven, and dishwasher safe structure, and versatility to be used on any stove top aside from induction heat. It is made from hard anodized aluminum which is durable and lightweight. It has a PFOA, Lead, and Cadmium-free non-stick surface which is healthy for the family. It has riveted, silicone infused, stay-cool handles for the best and safest grip. The lids are of tempered glass so that you can monitor cooking without releasing moisture and flavor. It is dishwasher and oven safe for up to 400°F. It features the thermo-spot technology which lets you know if the cookware is preheated enough and ready for cooking. The cookware set is designed for low and medium fire cooking primarily. It is not compatible with induction heat stoves. This set is beautiful in its copper exterior. It sits well with most kitchen appliances and has a scratch-proof coating. You won’t have any issues with food sticking in the cookware with its healthy nonstick cooking surface. It is dishwasher and oven safe for up to 392°F. The hard gauge forged aluminum construction not only is durable but also has even heat distribution. The cookware is made of hard gauge forged aluminum. It has great heat conductivity and even heat distribution. The copper exterior is not just beautiful, it is also scratchproof. 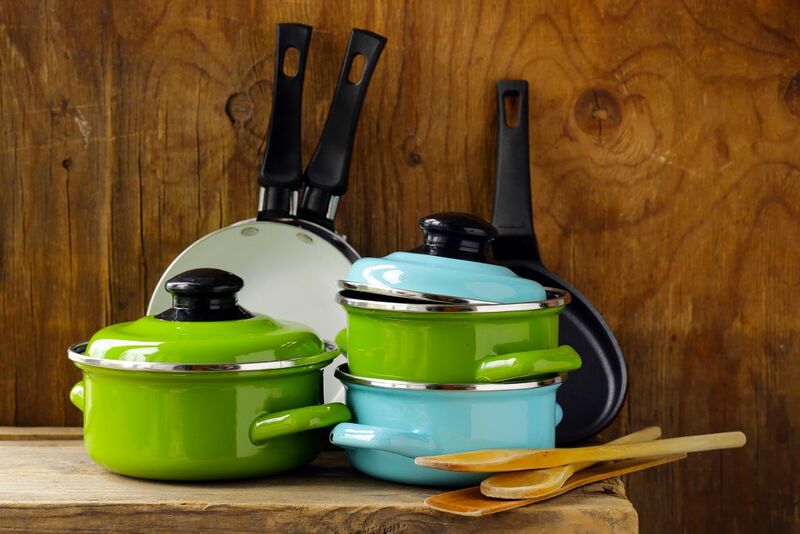 It has an enamel coated non-stick surface which is PFOA, PTFE, Lead, and Cadmium-free. It is safe and non-toxic. Food will easily slide off. It is dishwasher safe and oven safe for up to 392°F. The handles are double riveted for a more stable grip. The non-stick coating may peel off and scratch if regularly exposed to high heat, abrasive cleaners, and metal utensils. This set is very beautiful and elegant looking. The stainless steel body would look good in any kitchen. The good thing about this set is that even though it is stainless steel, it is infused with aluminum at the base to have an even heat distribution. You can have the elegance and sturdiness of stainless steel and at the same time have the cooking efficiency of an aluminum one. It has a gorgeous stainless steel structure that would look good at any set. It has an aluminum disc infused at the bottom for even heat distribution. It has the air-flow technology that allows the handles to stay cool for a proper and safe grip. It is very versatile as it can be used on any stovetop including induction heat. Glass lids are transparent so you can monitor your cooking even without removing the lid. The cookware is oven safe up to 500°F, except for lids. It doesn’t have a non-stick cooking surface. You can use the glass lid in the oven. This might be the only set that you will need. It has 17 pieces of cookware shining in its elegant stainless steel bodies, durable and efficient in cooking. The base of the cookware is infused with aluminum to increase heat conductivity and allow even heat distribution to the food. It also has excellent stay cool handles and lids that lock in flavor and moisture. The set is oven safe for up to 500°F, freezer safe, and dishwasher-safe. The set has a beautifully constructed stainless steel body that has aluminum-infused at the bottom for even heat distribution and better heat conductivity. The cooking surface does not react to any acidic food, ingredients with sodium, or any other chemicals. The handles are riveted for added stability and keep cool to the touch all the time. It is dishwasher safe, freezer safe, and oven safe for up to 500°F. Although the set is designed specifically for RV’s and boats, this stainless steel set can also be used at home. The best thing about this set is on how easy for all these 10 pieces to stack and store. It comes with a bungee cord for easy and convenient hanging. It also comes with interchangeable lids and removable handles. Everything about it is for easy and convenient storage. The stainless steel structure is reinforced with a triple-clad bottom for an even heat distribution and fast heat conductivity. It comes with interchangeable lids and removable handles, all for the sake of saving space. It is oven and dishwasher safe. It is imperative to remove the handles when cooking and attach only if needed in stirring, support, and moving. The handles have the tendency to melt if exposed to heat for long periods of time. The best set for me is the Cooks Standard 00391 11-Piece Classic Stainless-Steel Cookware Set. Aside from the fact that it has everything that you need on a cookware set, a stainless steel set with infused aluminum at the base, I find that the versatility of being able to use it on an induction heat stovetop gives it an edge. The Magma Nesting set comes in at a very close second.